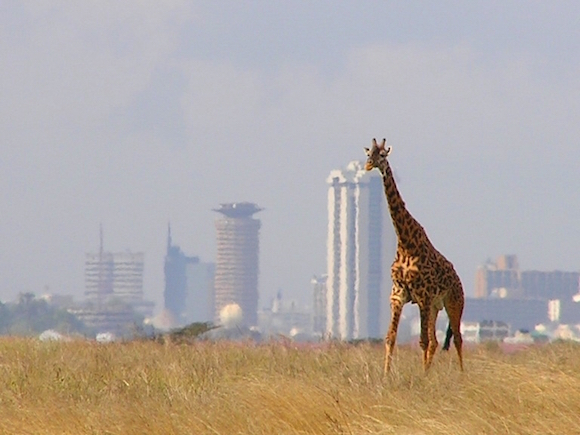 A lone giraffe in Nairobi National Park. Nairobi is the most intelligent city in Africa, according to an international think tank according to the Intelligence Community Forum. Nairobi was the only African city on the short list of 21 hubs worldwide for 2015. The opening up of communication, especially through the fibre optic cable and a widespread use of mobile money transfer services, especially M-Pesa, were among Nairobi’s strengths in the rating. According to the think tank, M-Pesa, which handles US $320 million (Sh29 billion) in payments monthly, equivalent to a quarter of Kenya’s GDP, is responsible for driving mobile phone penetration to nearly 70 per cent. In the process, it has activated economic activity by introducing banking services to low-income earners in towns and rural areas. via Nairobi now ranked as best African city.